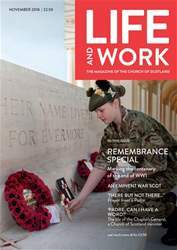 Your editorial (August 2018) raised the issue called for by the General Assembly for radical action to stem the decline of the Church of Scotland. We are all aware of this, I am sure, but the answers are not easy to reach, and, perhaps, not very palatable! So, for example, in that same Life and Work, in the Registers page it is noticeable that a substantial proportion of new elders are ladies. It is also noticeable in most congregations that a substantial majority of the congregation are also ladies. These two facts can be understood in two totally contrary ways. The straightforward understanding is that the preponderance of lady elders reflects the congregations; the other equally valid understanding is that men do not attend because of the women on the Sessions. I am well aware of the very excellent women elders, and there are certainly some very fine women ministers. As a lazy man, I suspect that many men are happy to leave the work to the women and think they do not need to be involved.